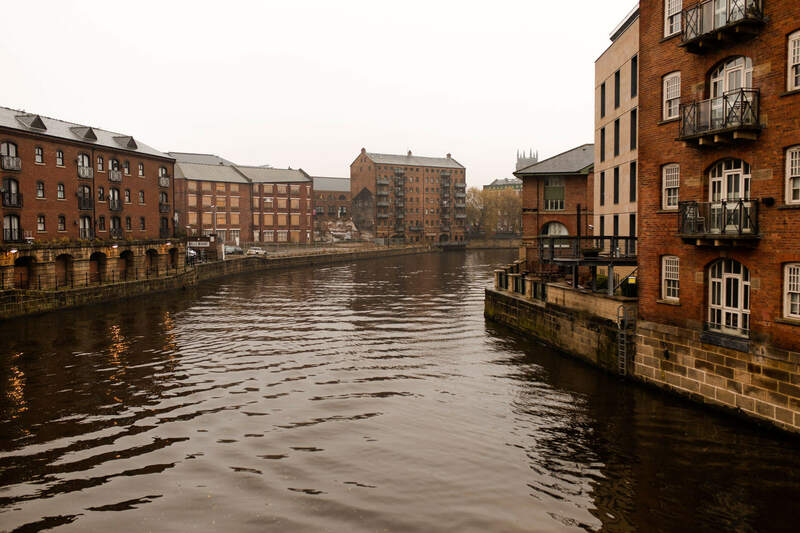 Last week I finally got the chance to head up north and explore Leeds. I’d heard so many things about this dynamic city prior to going (mainly about the thriving nightlife scene) but had just never prioritised heading up there to check it out for myself. You know how it is, we spend so much time visiting the far flung tropics and end up dismissing what’s right on our doorstep. Well, as you may well know after my first microgap to the Lake District last month, I’m working with Visit England to encourage you (and myself) to look a little closer to home when it comes to weekends away and so for my second MicroGap – I chose this urban city in the northern English county of Yorkshire. Microgap definition: A short break with an itinerary experience, challenge and adventure rich, offering all the developmental and experiential opportunities that a traditional ‘gap year’ would entail but instead – in just a few days. See more about microgaps here. Top tip: Search on thetrainline.com for tickets. Book in advance / at the right times and you can get the train real cheap! 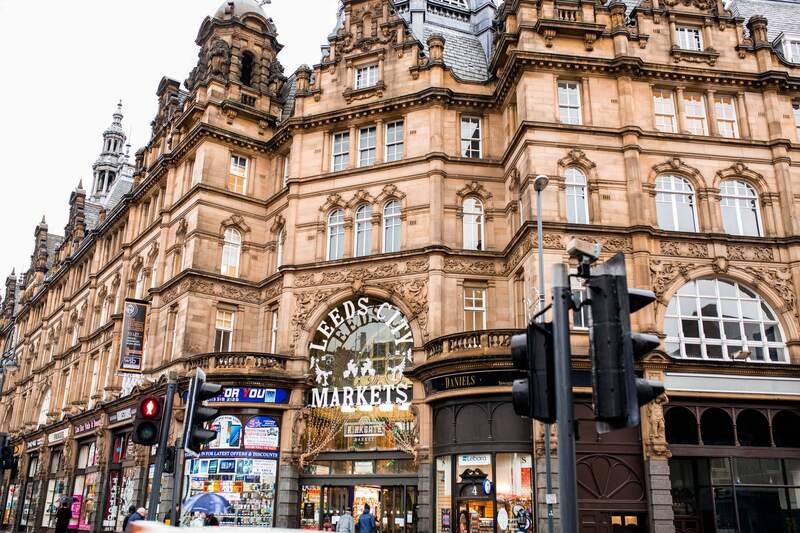 Otherwise Leeds is typically a 4 – 4.5 hour drive (no traffic) from London. As ever, I’ve popped all the hotspots I went to, heard about and noticed whilst I was exploring and have pinned them all on a Google map below for you. 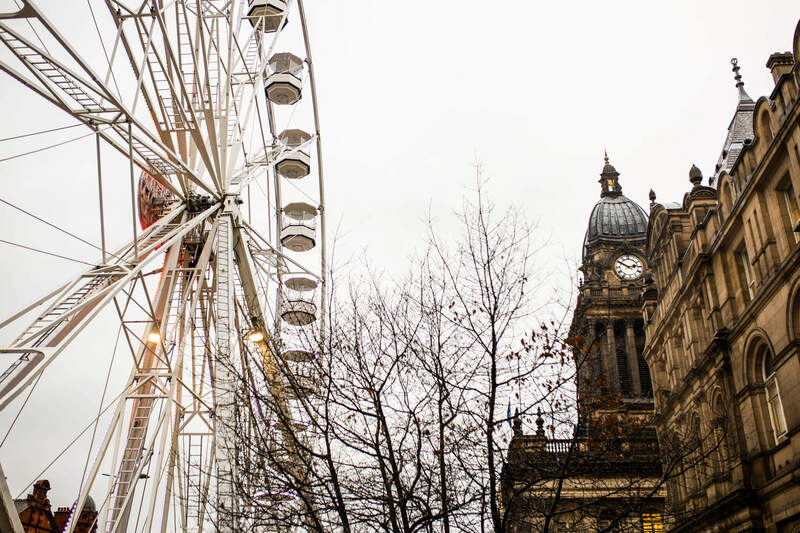 Open this post up when you’re on your adventure in Leeds and you’ll be able to use the map to navigate to the hottest spots in town! On day 1 of my microgap in Leeds I jumped on the train at 8am and arrived by 10am to the city centre, where the main train station is located. It was too early to check in to my room at Dakota Deluxe (unbelievably chic hotel that I rested my head in) so I dropped my bags with the lady behind the reception desk and headed into the hotel bar to grab a cup of tea and look at the city map. I have to say, Dakota Deluxe was without a doubt one of the most beautiful hotels I’ve ever stayed in. I absolutely loved the seductive mood lighting that graced the corners of the whole establishment and too, the presence of maps and candles in the entrance decor. It only got better when I got to my room. The attention to detail was ridiculously pleasing and went beyond: arrival treats, spa gowns, Nespresso coffee machines, both a shower and a bath, lux toiletries, a desk, sky tv, turn down service, spa robes and a completely complimentary fridge. Honestly, it’s always the little things and touches in hotels for me. The seemingly cheap and minor details that bring a hotel experience to life. It’s a 10/10 from me. On my first day in any city I like to get my bearings with either a walk around town, a cycle or a tour of some sort. 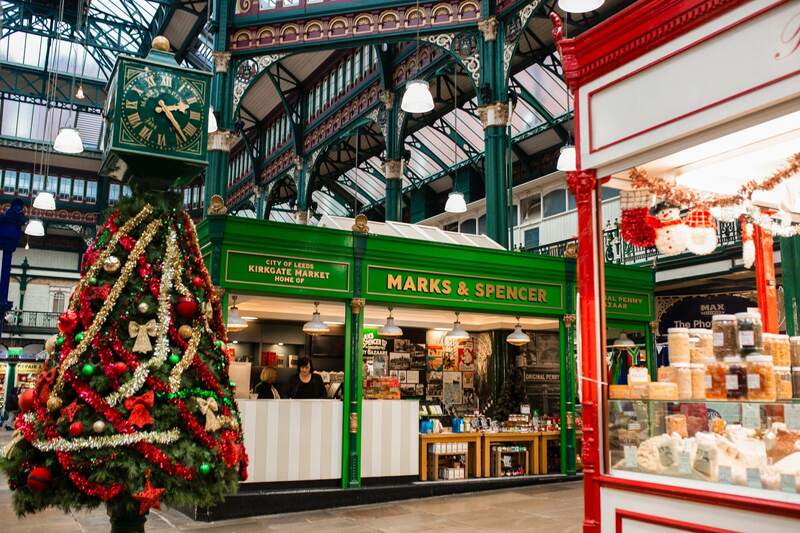 Today, thanks to Visit Leeds, I was lucky enough to be linked up with Blue Badge Tour guide and all around legend Mike for a whistle stop tour of all the main landmarks and must sees in the city centre. But first (food first always) lunch at Bundobust – an incredible little restaurant serving Indian street food. Recommendations: Okra Fried (Coated in chickpea batter. Seasoned with black salt & mango powder. ), Onion, broccoli and kale bhajis (Served with a tamarind & red pepper chutney). Amazing vegan options. See the full menu here. Mikes’ top tip: Head to the outside fruit and veg market where you will find 10 avocados for £1. 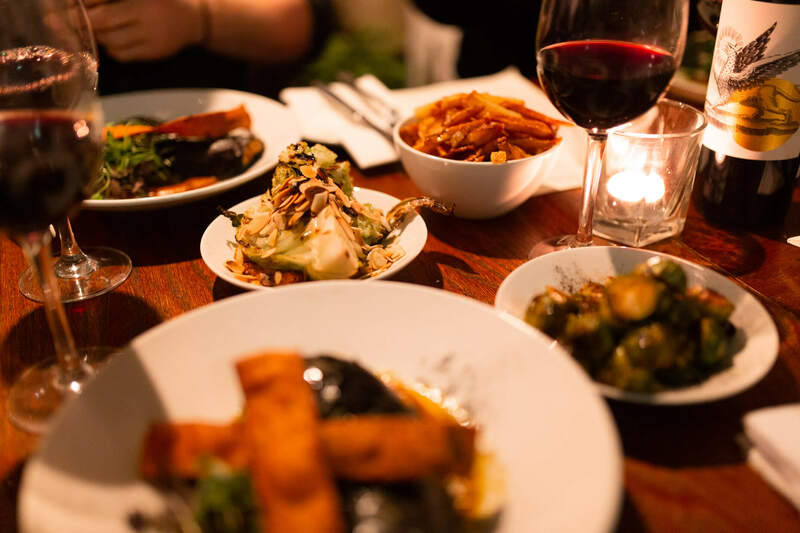 By evening, after a freshen up in my hotel room, I walked across to Northern Monk Refectory a brewery where you are welcomed to eat, drink and play. 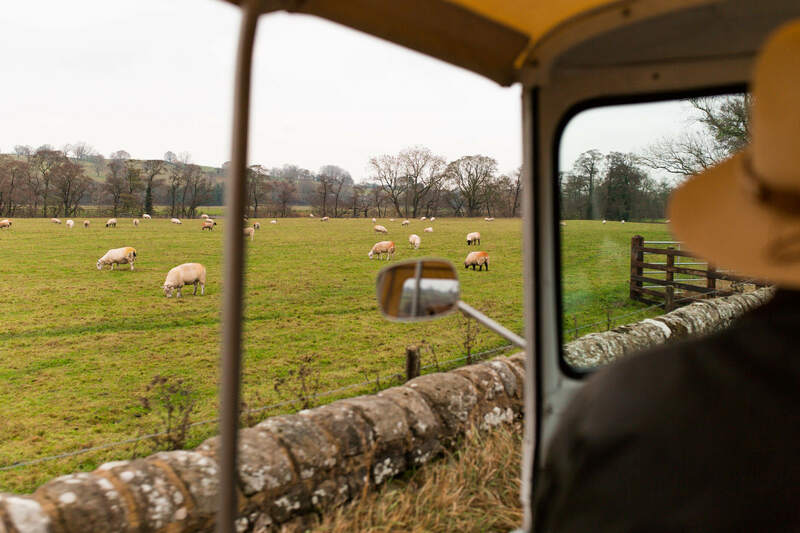 The brewery is located near Harewood Estate which has a long history of food production, and champions itself on using only the best, freshest locally sourced produce. Honestly… I had no idea the food was going to taste so good. The menu options were minimal and with a preference for something light I ended up going for the Roasted Garden Carrots, Red Hummus, Buckwheat & Mint to start and the Celeriac Steak With A Truffle Sauce, Toasted Hazelnuts & Maitake Mushroom for main. Both meals were unintentionally Vegan and potentially the best, most flavoursome vegan dishes I’ve ever had grace my tastebuds. 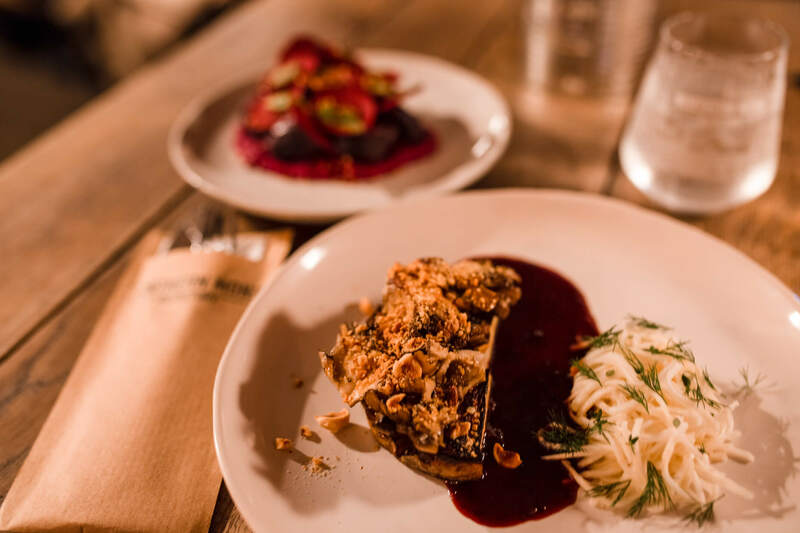 For a brewery restaurant, Northern Monk Refectory exceeded my expectations. For all you beer lovers, the NMR tap room features 16 keg lines, 2 cask lines and they have an extensive can selection. 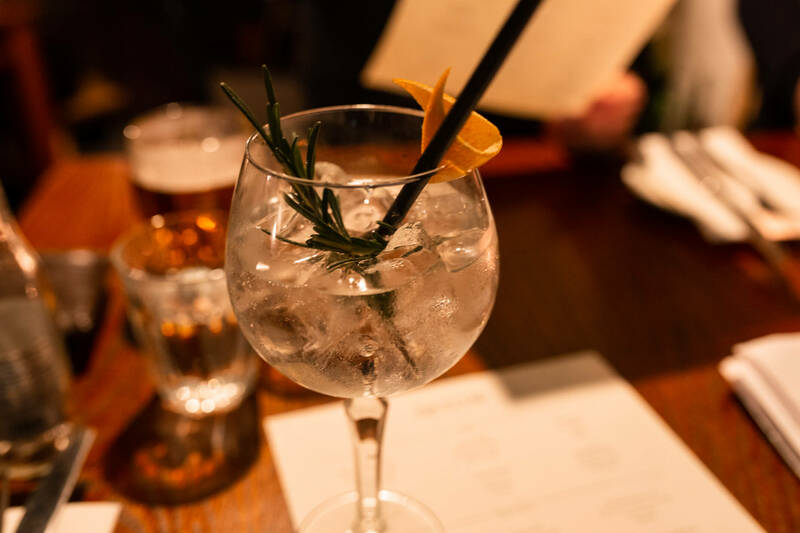 The perfect place to come with your friends for a few bevvys after work or on the weekend. Watch out for Wednesday Quiz Night and beer festivals that they host here on the site. See more on their website here. 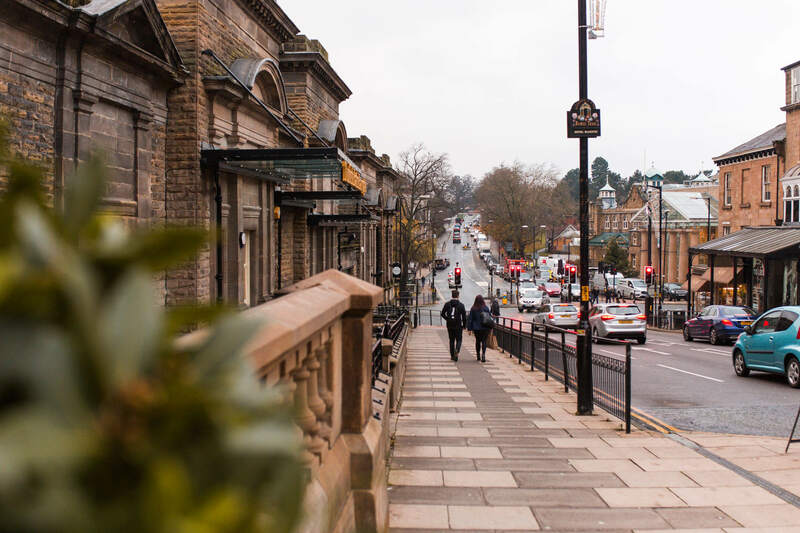 Top tip: If you’re still bustling with energy after dinner consider these roof top bars for an extra tipple and panoramic views: Angelica, The Maven, The Domino Club, Headrow House. 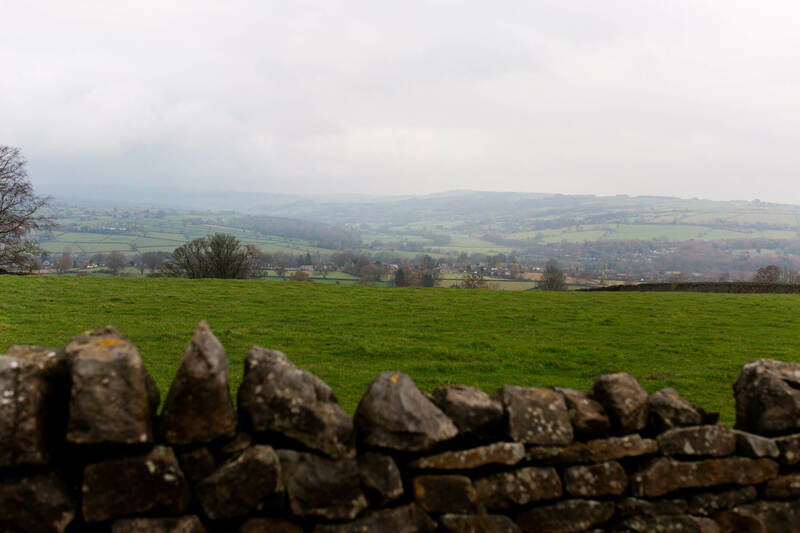 There was no way I could come to Leeds and not dip into the Yorkshire countryside for at least the afternoon which is totally possible with the 35 minute direct train that takes you to Harrogate from Leeds station. More of a rural girl at heart, I decided to dedicate almost a full day to the country and set off straight after my breakfast at the hotel. P.s. If anyones staying a bit longer and fancies a challenge, a couple of years ago I did the Yorkshire Three Peaks in the nearby National Park which was AWESOME. You can see my guide to completing the challenge here. Top tip: Trains leave every half an hour from Leeds to Harrogate. Download the Trainline app to check train times on the go! After announcing my whereabouts on Instagram stories, I was inundated with messages from people saying that I had to get to Betty’s Tea Room. With the winter temperatures setting in and my fingertips kindly requesting a little extra warmth, I surrendered to the request and went for a cup of tea… and a gingerbread cookie. 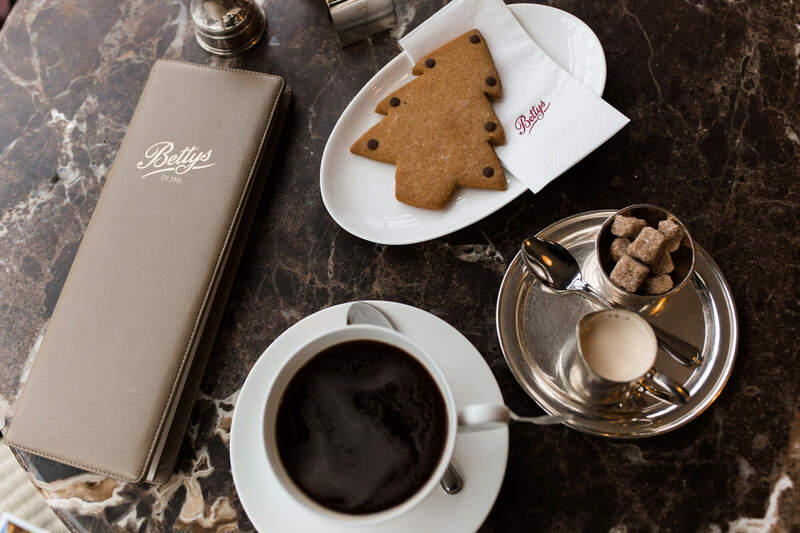 Filled with the cosy laughter of old friends and new over warm drinks and freshly baked delights – it was like coming home the moment you walked through the door of Betty’s Tea Room. 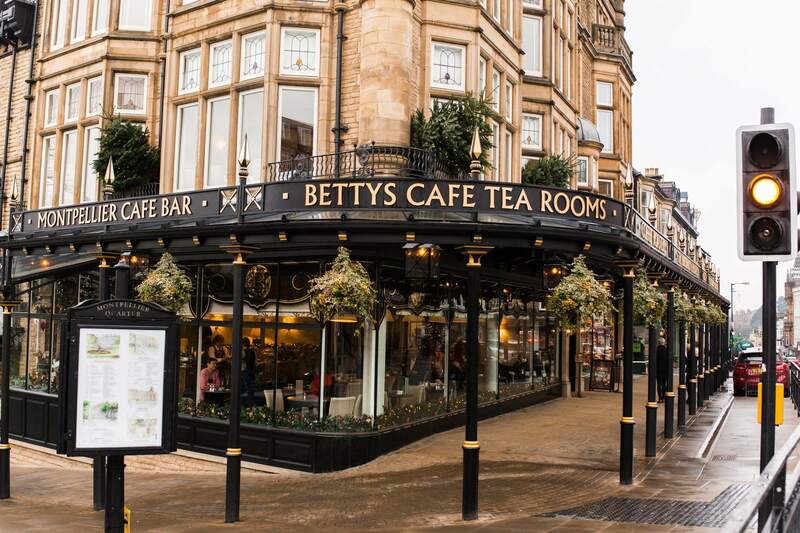 The Betty’s story started in Harrogate nearly 100 years ago. Much has changed since 1919 but at least two things remain the same: our treats are just as delicious and our welcome is just as warm. Next up, after raising my internal temperature with both a cuppa Yorkshire tea and a wander around the shops and the Montpelier Quarter – it was time for the activity I’d been waiting for. You may have seen it on the gram and I can tell you now it was every bit as unique as it looked. 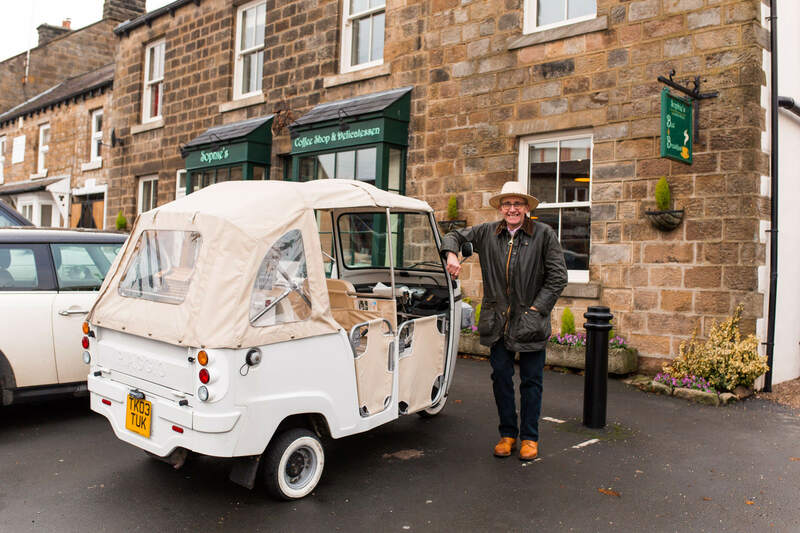 I went on a Tuktuk tour of the Yorkshire Countryside with Love Tuk-tuks. I kid you not. Andrew had a crazy idea a few years ago to bring the Vespa made motor to the UK and he’s been a local legend with his business since. Running people between events, to weddings, proms and through the countryside he has without a doubt nailed his USP and I was here to give it a test run. Admittedly, late November isn’t the ideal season for the experience as the winter temperatures can make it a slightly (very) chilly ride but armed with two hot water bottles and about five blankets – nothing was stopping Andrew and I inhaling the fresh air as we cruised through Fewston and through the stunning Washburn Valley. Can I just say (I don’t have to at all) that Andrew really is as charismatic as tour guides come. An absolute joy to spend the afternoon with and so passionate about where he lives and about sharing his knowledge with you. 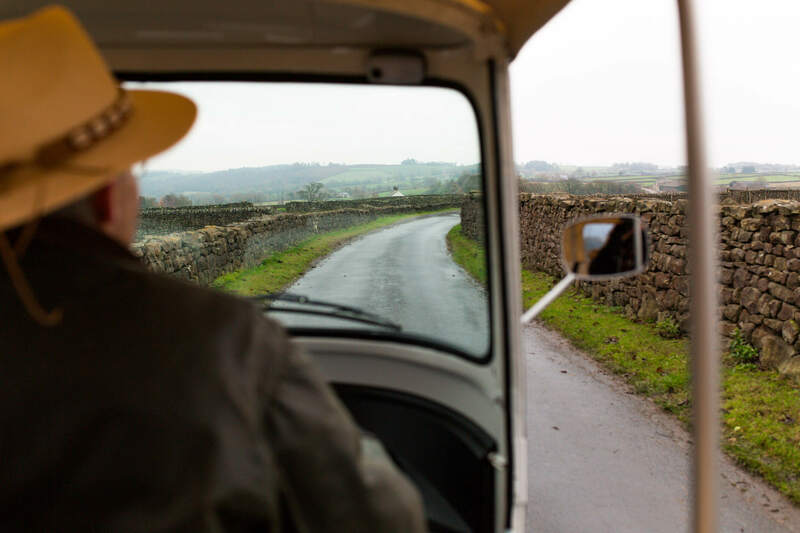 Andrews’ bespoke tuk tuk tours into the Yorkshire Dales are the perfect gift idea if you ask me. Grab the pair of you a picnic, a bottle of bubbly and head out on a once in a lifetime experience with a loved one. See more and book your experience here. If you do happen to land your booking on a day when the sun isn’t shining quite so bright you could either: head back to Betty’s for a hot chocolate and cake (problem solver) or upon returning to Harrogate town from the tour you are literally crawling distance from one of the only 7 remaining Turkish Baths that date back to the 19th century. This one in Harrogate has been fully restored and recreated to look just like it would have back in the day. Down to the finest details they even had Italian experts come to lay the terrazzo floors. It’s honestly stunning inside and is the perfect place to relax and rejuvenate in a tranquil environment. 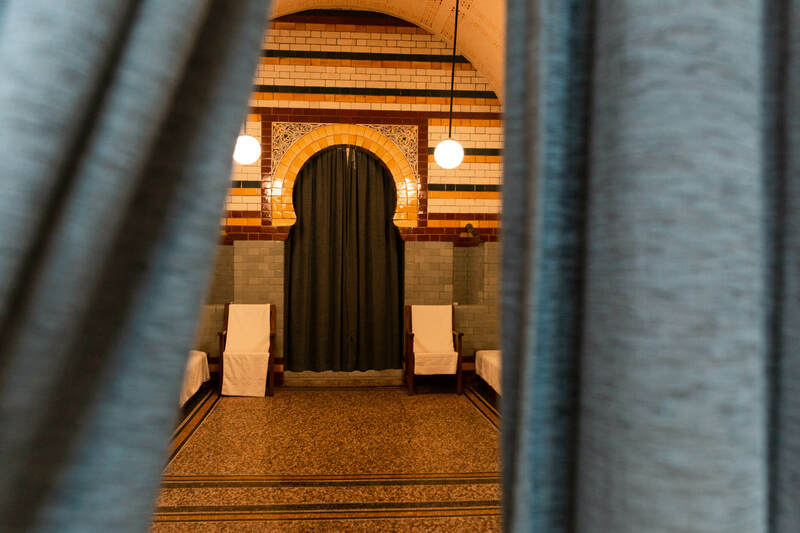 You get, I think, a two hour session (with a limited number of people) during which you are free to follow the ritual of heating, cooling and cleansing through the hot room chambers. There are 3 chambers all at different temperatures, a plunge pool, a steam room and bed to lie on in the Frigidarium. It’s up to you how you to do it but the staff are on hand to share their expertise and spa tips at all times! Find out more and book your spa experience here on their website. 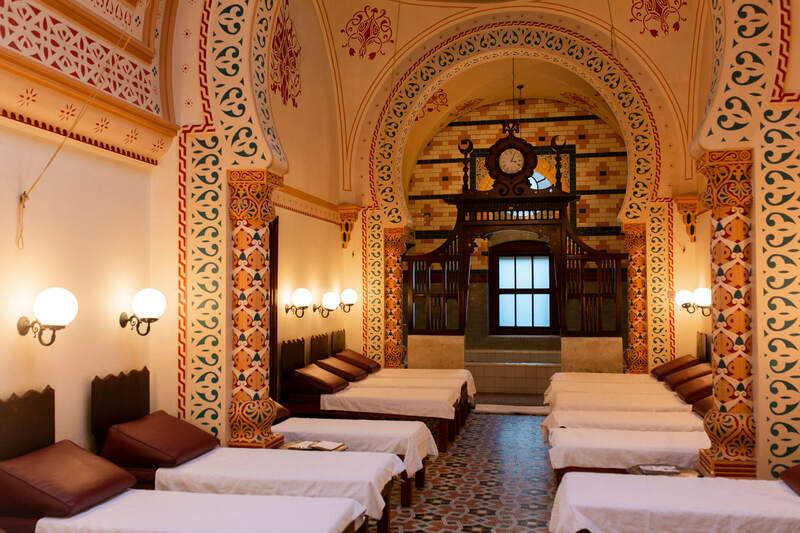 Once I’d showered and freshened up from the Turkish baths I was pretty much ready for bed and so I headed straight back to the train station to catch the 5pm train back to the city for dinner. Though the spa completely had me ready to roll between the sheets, there was no way I could miss dinner at Ox Club. Not only because the food is Michelin-listed and the best that Yorkshire has to offer but also because the same friends I had completed the Yorkshire Three Peaks challenge with a couple of years back (and that live in York) were coming to meet me! I started with one of the dishes off of the specials board which I cannot for the life of me remember the name of but it was an Iberico ham. The fact that I had ham says it all as I don’t often eat meat unless it’s done really well and this… was most certainly that. I followed my starter up with the Grilled Aubergine from the Ox Club A La Carte menu and then shared the cauliflower and sprouts on the side with a friend. The table was also graced with the boys’ choices amongst which was the Onglet steak and the Oysters – everything looked and smelt amazing. Crazy as I sound listening to myself – the ham was probably my favourite of the lot! Top tip: If you’re keen before / after dinner, they have a rooftop bar here at Headrow House! Still full from dinner the night before at 6am when my alarm went off, I popped my yoga pants on and walked the 25 minutes down to Leeds Dock from my hotel where I arrived for the first class of the day at Yoga Hero. 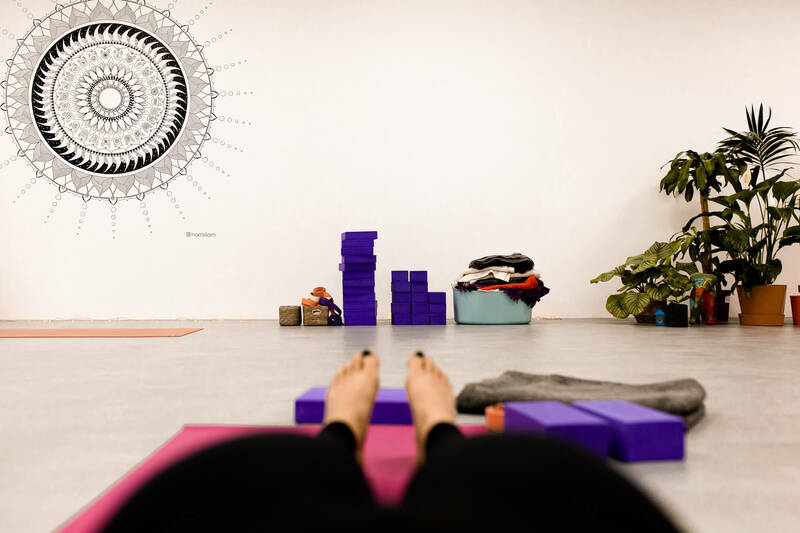 A welcome discount from the £20-30 you pay per class in London for yoga, this £6 class was the perfect start to my final day in Leeds. I did a 45 minute rise and shine yoga flow and followed it up with a decaf coffee at North Star Coffee next door. Now you know a coffee shop is good when their decaf blows your mind. One of the best coffee’s I’ve ever had. Period. Get yourself there. Talking of good coffee, by afternoon my schedule with Visit Leeds had me walk through town and check into the 200 Degrees barista school in the centre for an hour of beany knowledge. I learnt how to use an espresso machine for the first time (is it just me or have you always wanted to do that too? 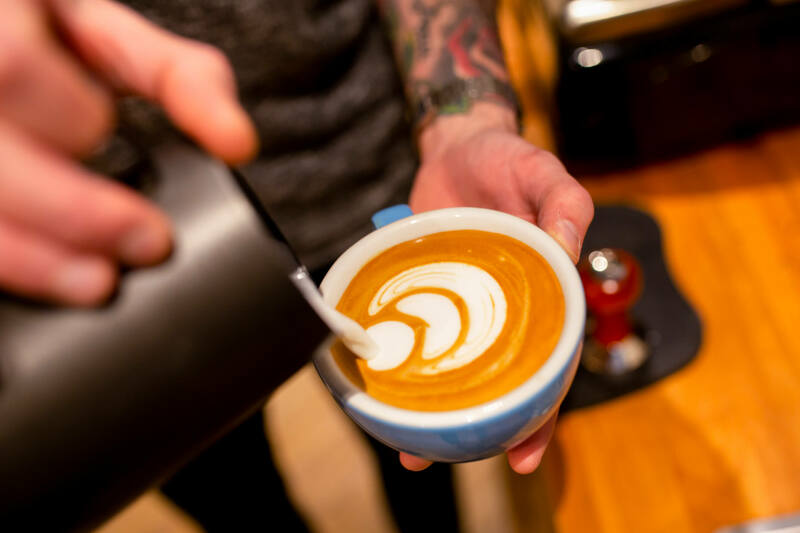 ), I learnt how to steam milk into the smoothest of consistencies, I learn how to make THAT heart with the froth on the top of the coffee and Graham also took me through how to use a Chemex and a Cafetiere at home! Beyond that, we ran through different beans and what notes are prominent when grown in different countries. We were taken through the importance of roasting and the effects of bean growth at different altitudes. I had no idea there was so much to coffee!!! It’s a whole other world!! It was such a cool experience and another unique afternoon option should you find yourself here in Leeds. P.s. 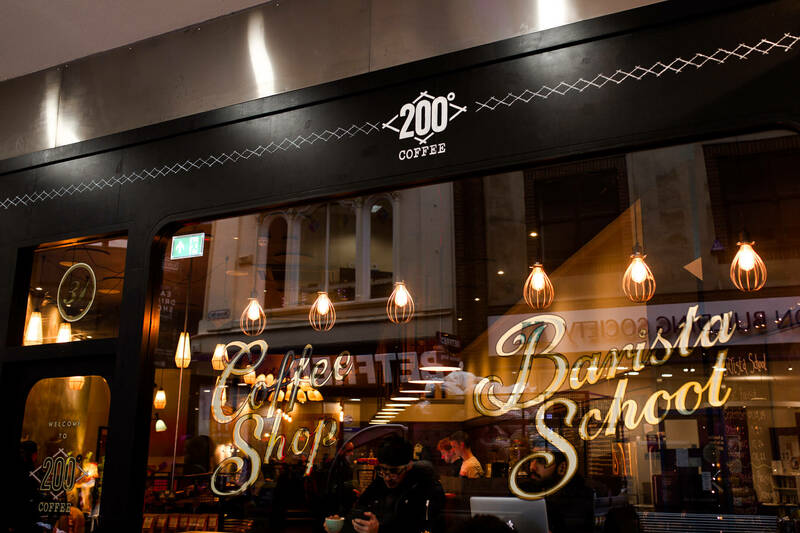 Even if you don’t fancy the Barista School, the 200 Degrees cafe is below and you should most definitely grab yourself a Brazilian Love Affair coffee with oat milk. It’s just a wonderful mix. Last but certainly not least before catching my 17:00 train back to London, I headed to The Tetley for afternoon tea. Formerly the Tetley Brewery, this establishment is now a centre for the contemporary art and is located just over the river from the centre of town, in the heart of Leeds’ South Bank. 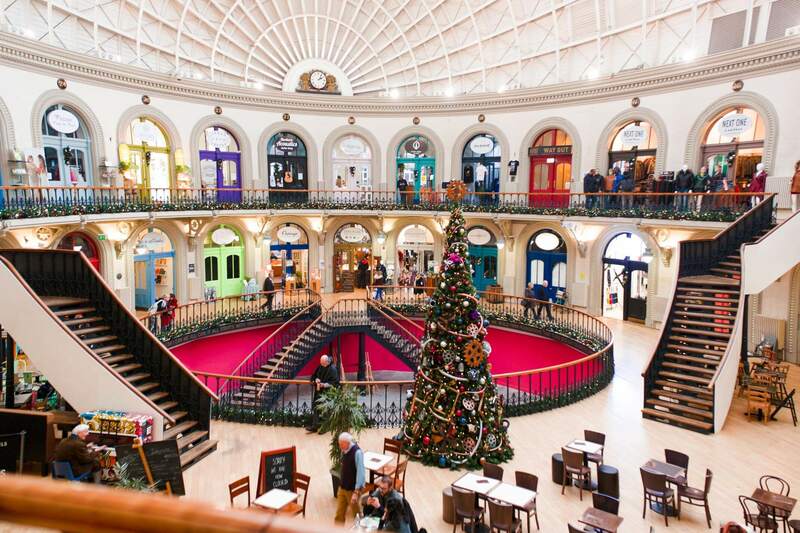 If Afternoon Tea isn’t your thing (you crazy), The Tetley are host to an array of events and exhibitions throughout the year. You can check what’s on here or just pop along for a pint and see what a spontaneous visit brings you. If you happen to head for the Afternoon Tea before Christmas, you’ll get their festive spread which contains a cinnamon scone. Promise you’ll bring one home for me? 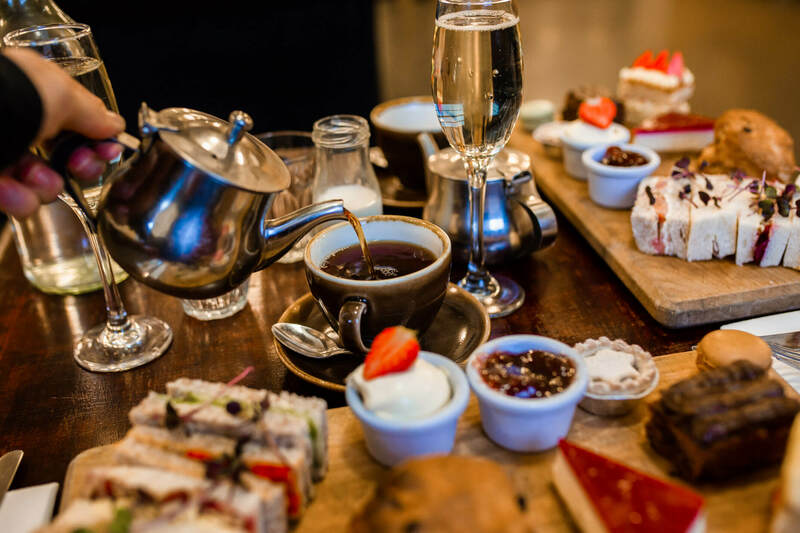 Afternoon Tea is super popular here so make sure you book in advance (£16.50pp). The waitress told me that they like to cater to bookings and ensure the spread is as fresh as can be! That it certainly was. You can’t get more English than that can you? A cup of tea and a scone with clotted cream and jam. Mmmm-mmmm. 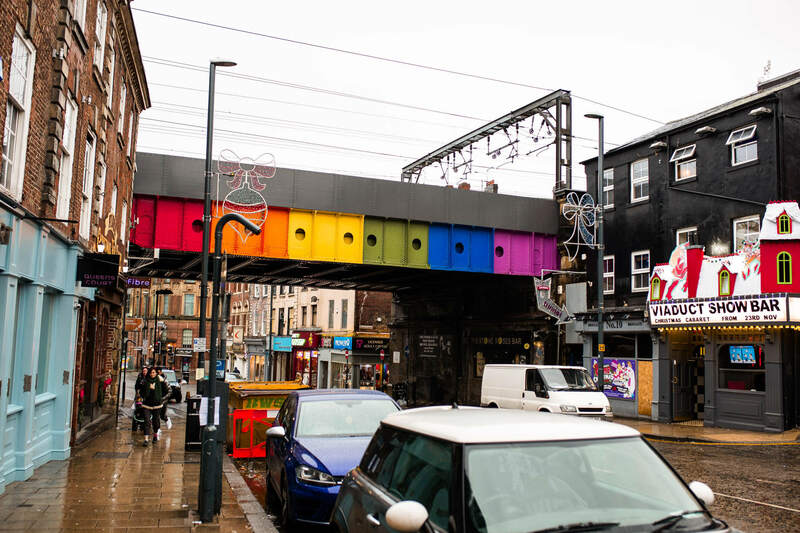 Heading to Leeds and want to keep up-to-date with what’s going on? Stay tuned for my next microgap – it’s coming! 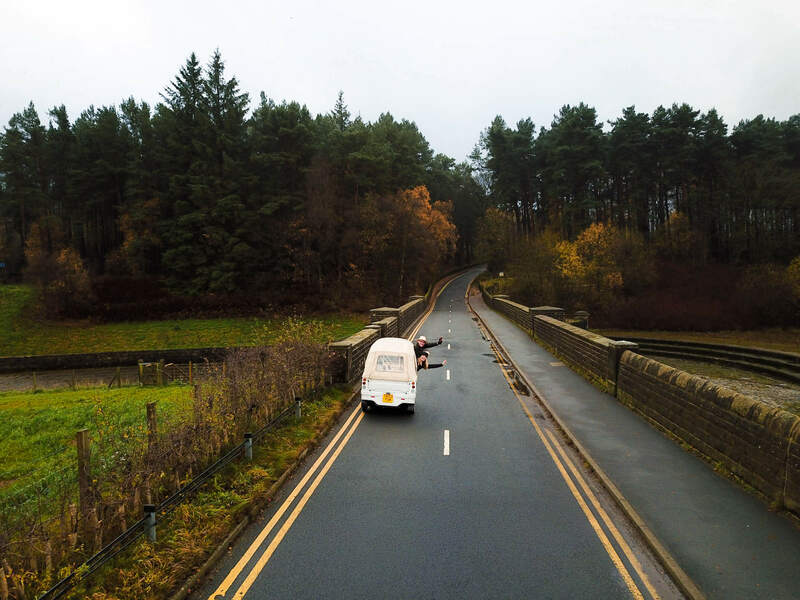 Meanwhile you can get alllll the UK adventure inspiration here. Where would you like me to go next in England?